Lando Calrissian is reportedly back for Star Wars 9. For those sighing and rolling their eyes at the prospect of the franchise going back to the Original Trilogy well for the umpteenth time – I don’t blame you. 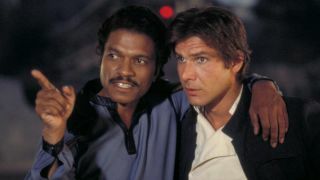 But hear me out: it’s a good thing that Billy Dee Williams is returning because Lando is one of the most complex, multi-layered characters in a galaxy far, far away and, unlike Luke, Leia, and Han, his story was left unfinished, a thread tantalisingly waiting to be wrapped up and given closure. We don’t know why Lando is back yet – and that’s what makes his return so exciting. Could he join forces with the First Order (it wouldn’t be the first time he did a deal with the devil) or has he fully changed his ways and adapted to his heroic life in the interim post-Return of the Jedi? It’s such a promising move from Lucasfilm that it instantly dragged my hype levels right back up. Sure, I would’ve preferred Lando to return first before upping the ante with Luka, Leia, and Han further down the line, but his come back still marks a possible tonal shift for the franchise, which will hopefully provide us with some fan-service, which is more than just a classic character dragged back to become old, weary, and weighed down by the world version of their Original Trilogy selves. I’m looking at you, blue milk-drinking, infinitely grouchy Luke Skywalker. I want OG Lando, damnit. Why? Because Lando is quick-as-a-whippet and whether it’s Donald Glover or Billy Dee Williams rocking the cloak of the Cloud City head honcho, his character will give us the perfect break from the lingering talk of lightsabers and the like. He’s the best bit of every scene he’s in because he’s so far removed from the action; he’s off in his own little world. You only have to look at his Cloud City shenanigans and everything that happened between him and Vader to see why Star Wars 9 is only going to be better with him in it. Watch his furrowed expression as he talks to Vader and realises things aren’t going to plan, witness the machinations of his mind slowly whirr into life as he gets a chance to turn the tables on Han, and check out his later reaction to getting punched by the smuggler. It’s some of the best acting in the franchise. This is a man like no other. Not only does he ooze cool – which very few Star Wars characters actually do - there’s an air of double-sidedness to everything he says. Every painstaking moment, from friendly introduction to bold betrayal, has us hooked, unable to take our eyes off his smarmy smirk and swaggering style. It works because Lando isn’t Star Wars. He simply happens to exist in a galaxy far, far away and others have the misfortune of crossing his path. Lando is a character you’re immediately invested in and yet, you’re still left guessing about. He’s a character that talks out the side of his mouth rather than blithely blabbering on about the Force and destinies; he is a man who enjoys a good space dollar as much as the next guy. Dare I say it, he emphatically grounds the franchise and keeps things from getting too silly and melodramatic. Used correctly, he could be the failsafe to stop Star Wars 9 from ballooning out of control as it twists and turns to reach a suitably epic conclusion. But there’s the rub. How will ge be used? Lucasfilm have made a show of killing off (or severely wounding) every major player who’s returned from the first three Star Wars movies. At this point, a Lando death would not only be cheap, it would go against everything this character stands for. Against all the odds, he gets to survive, precisely because he’ll do anything to worm his way out of a life-or-death situation. Without wanting to put too much weight on the shoulders of the movie, how Star Wars 9 treats Lando may affect the entire film. Kill him, and all we get is a quick nostalgic reaction. Let him live, breathe, and prosper, and Lando is able to actually add to story without feeling like a one-note tribute act. So, please, give us Lando back. But give us the version we all know and love. Give us the banter, give us the betrayer, give us the ballsy, cocky attitude that everyone wants to punch and parade in equal measure by the time Return of the Jedi ends. I don’t want a time-ravaged Calrissian, weighed down by his past mistakes. We’ve already covered that with Luke, Leia, and Han. Lando should be easy, breezy, and oh-so-ready to make the heroes and villains of Star Wars 9’s lives a living hell – as long as he can make a quick getaway in the process.